It feels like a lifetime has passed since Christine Blasey Ford went public with the allegation that Supreme Court nominee, Brett Kavanaugh, sexually assaulted her at a house party in the early 1980s. In the last 48 hours or so, the pro-Kavanaugh camp has been viciously conspiratorial, resorting to Alex Jones-style rhetoric. Here are a few particularly nauseating theories about Ford that have been circulating on social media and propped up by major news outlets. It was bad enough when the Washington Post published “Is there a Kavanaugh doppelganger?” in which columnist Kathleen Parker echoes Senator Orin Hatch’s theory that Ford was merely “mixed up” about who allegedly assaulted Ford and that perhaps another “Kavanaugh-ish-looking teen at the house that night” was responsible. But it somehow managed to get worse when Ed Wheelan, president of the conservative think tank Ethics and Public Policy Center, published an unhinged Twitter thread implicating another Kavanaugh doppelgänger of the alleged attack. Thanks to Zillow floor plans, Google Maps results, Facebook photos, and the pompous notion that he was a true sleuth, Wheelan deduced the sexual assault happened in the home of one of Kavanaugh’s Georgetown Prep classmates. Wheelan also suspected that this classmate (who he named), was likely Ford’s attacker; he even added a side-by-side comparison of him and Kavanaugh, concluding that the two look alike. But Ford knew the man Wheelan accused of assaulting her; she socialized with him and even visited him in the hospital one time. “There is zero chance that I would confuse them,” she said. At least the dopes at Fox and Friends were impressed. 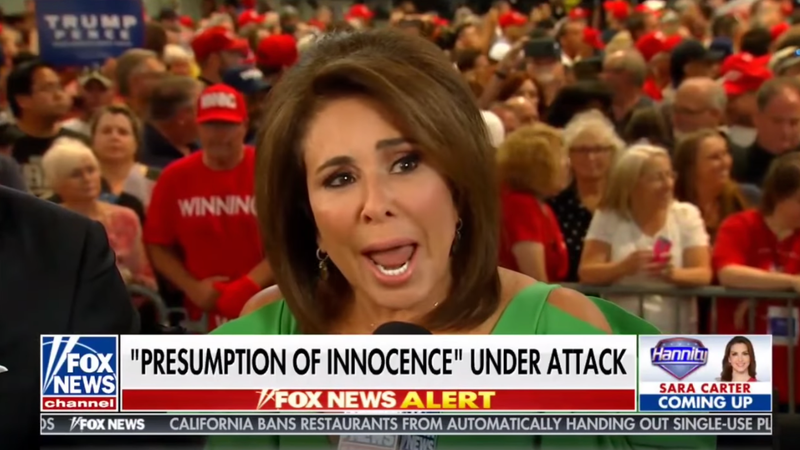 Fox News blowhard Jeanine Pirro is convinced politics is driving the accusations against Kavanaugh. But it’s not just ruthless Democrats who are complicit. Pirro won’t rule out the idea that Ford’s therapist hypnotized her into thinking she was sexually assaulted by Kavanaugh. It’s a senseless call back to the false memory syndrome hysteria of the 1980s and 1990s. SEAN HANNITY (HOST): My understanding is, didn’t they say that this came out for the first time in couples therapy in 2012? PIRRO: Yeah and what was that about, and when was the first time Kavanaugh’s name came up? And what about, is this hypnosis? Is this confabulation? This is all stuff that is contrary to what the law calls for. At this point, it wouldn’t surprise me if Pirro believes Ford’s therapist is a psychic and knew Kavanaugh would be nominated to the Supreme Court and planted this false memory into Ford’s head for the long con. Was Kavanaugh respecting Ford’s wishes before or after he allegedly put his hand over her mouth as she screamed? Unclear! Graham then pivoted to the familiar every-teenage-boy-has-sexually-assaulted-someone-so-it’s-no-big-deal defense. There’s a lot of things I’ve done when I was a teenager that I certainly am ashamed of and not proud of. If we’re going to hold people accountable for things that they did forty years ago and say whether it’s relevant or not relevant—this is a tactic by the left to try to keep conservatives off the bench. And it’s unfortunate that it’s working. People are up in arms over this. Like, ‘oh, this is such a disaster!’ You’re talking about two teenagers forty years ago. That has nothing to do with what we’re talking about today with this man being a judge on the supreme court? And they call it a sexual assault? No, I don’t believe it. What the rest of the day and weekend will bring us from the Ford conspiracy theory factory is anyone’s guess. But as conservatives like Mitch McConnell insist that Kavanaugh will become a Supreme Court justice (“We’re gonna plow right through it and do our job,” McConnel said on Friday) regardless of Ford’s allegation, the more narratives will be spun with the sole purpose of transforming her into little more than a confused woman or an irrational liar. The excuses for Kavanaugh—from mistaken identity to the more mundanely familiar “good man” rhetoric—are bound to become more fantastical. But then, neither “reasonable” nor “rational” have ever been a threshold for misogyny.